Archives : UPSIDE MOMENTUM CONTINUES - 09/09/2010. UPSIDE MOMENTUM CONTINUES - 09/09/2010. The market gained further momentum when it was decisively able to close above the Sensex level of 18500 and Nifty 5555. That level was the Rising Channel Top of the last one year for the market. As a result of this Rising Channel breakout, the medium term target for the Sensex falls at 20627 and Nifty 6180. In the short term point of view, both the indices were able to close above the Broadening pattern, and the target according to that pattern formation, falls at Sensex 19283 and Nifty 5790. 5349 – A CRITICAL SUPPORT. 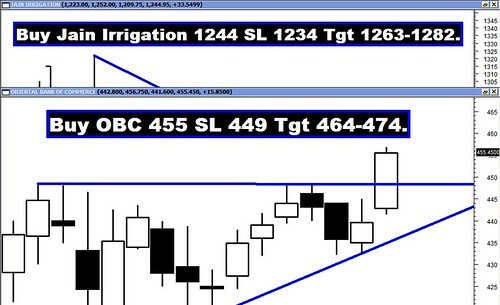 Two weeks back both the indices formed a Hammer which is a Bullish Reversal candle pattern. As a result after that the market has rallied and even managed a close above the Rising Channel. Thus the reversal level for the Sensex 17819 and Nifty 5349 assumes critical significance. As long as the 17817 for the Sensex and 5349 for the Nifty remain intact, the uptrend will continue. The Sensex opened the week at 18124, made a high of 18823, a low of 18124 and closed the week at 18799. The Sensex gained a whopping 578 points on a weekly basis. Similarly Nifty opened the week at 5479, made a high of 5647, a low of 5479 and closed the week at 5640. The Nifty too closed with the week with a solid gain of 161 points. On the weekly charts both Sensex and Nifty have formed a complete White body Marubuzo. This is a Bullish candlestick pattern and its bullish implications will be seen in the next week. On Friday, as per the daily charts, both the indices have formed an Opening White Body Marubuzo which is also a strongly bullish formation. Since last October, the market is moving in a rising channel and the channel top has provided strong resistance to the market and that supply trendline top was falling at Sensex 18500 and Nifty 5555. 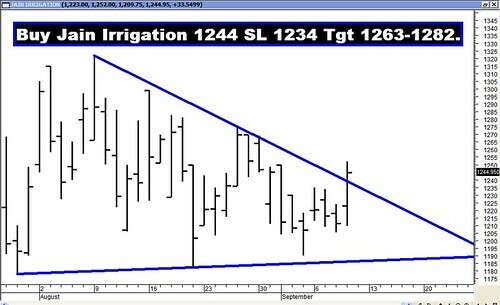 Both the indices have closed above their respective Trendline tops and hence a bullish breakout is in place. Due to the Rising Channel Breakout, the medium term target for the Sensex will be at 20627 and Nifty 6180. The above pattern formation is keeping in mind slightly longer time duration in mind. But if we consider short dynamic pattern formation then we have a Broadening formation for both Sensex and Nifty. Since the Sensex and Nifty have closed above the rising trendline of the Broadening formation (Sensex – 18672 and Nifty – 5598), a Broadening pattern breakout is in place. The target for this Broadening pattern breakout is Sensex – 19283 and Nifty – 5790. In the current upmove both the indices have rebounded from Sensex 17819 and Nifty 5348 and in the process have registered higher bottoms. Sensex has formed higher bottoms at 17819-17373 and Nifty has formed higher bottoms at 5348-5210. The uptrend will be in danger only if both the indices close below their higher bottoms i.e. Sensex – 17819 and Nifty – 5348. In such a case a down trend will be triggered and the market will then head towards next major higher bottom which is at Sensex 17373 and Nifty 5210. One need not worry about the medium term as long as the level of 17373 for the Sensex and 5210 for the Nifty remains intact. On the moving averages front, both the indices are well above their 20dma (Sensex – 18292 and Nifty – 5495) and 50dma (Sensex – 18087 and Nifty – 5431) hence the short and medium term trend are positive. Majority of the oscillators are showing strength and in Buy mode. MACD and ROC have signaled a Buy and are in positive territory. The RSI is at 68 and is indicating further momentum. Stochastic oscillator is in overbought territory. The ADX has increased and is currently at 24 which indicate that the current trend is gathering strength. The Directional Indicators are already in Buy mode. The MFI is in Buy mode and so is the OBV. The O.I.PCR is entering highly optimistic zone at 1.83. Highest Put writing is seen at strike of 5400 strike and highest Call writing is seen at strike of 5700. This indicates a Nifty range of 5700 on the higher side and 5400 on the lower side. Good addition in open interest for 5500 Put indicates short term support at that level. Sensex has strong Trendline Support at 18550. The Trendline Resistance for the Sensex is at 19010. Nifty has strong Trendline Support at 5571. The Trendline Resistance for the Nifty is at 5736. For the week ahead, Sensex will find Support at 18671-18540-18383 and will find Resistance at 18930-19127-19332. For the week ahead, Nifty will find Support at 5604-5567-5524 and will find Resistance at 5683-5736-5790. LAST WEEKS RECOMMENDATIONS:We hit Bulls Eye once again as all the stocks reached their target with ease. The star performers for the week were MRF and Bajaj Auto which can be seen as per the table given below.